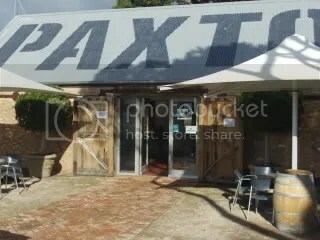 Paxton Wines was one of the first wineries I visited about 2 1/2 years ago when we moved to McLaren Vale. The smiling face then was one Ben Paxton. I was destined to meet Ben a few times between then and now and we even friend-ed each other on FaceBook. I enjoy their wine then and I was looking forward to my visit. The next couple of hours were very enjoyable. The Paxton Cellar Door Manager knew the Lonely Grape blog – I was excited. After tasting some excellent wines and catching up with Ben a couple of people walked into the cellar door. One of them came straight up to me and said – “aren’t you Shane!”. It was Tim from Secret Vines – a wine sales web site and he has been checking out the blog. The lady next to him turned out to be Marion from Master Chef Australia. Well I had fun chatting about all sorts of things like wine, food and TV. Generally I am not a Pinot Gris fan. I find this varietal quite flavorless and at times almost like drinking water. In this case there was a citrus minerality with a green apple and pear thing happening. Not enough happening here for me to part with 20 bucks, however I can see this wine appealing to the Sauvignon Blanc drinkers amongst us. The tasting notes for this wine sparked my interest straight away – french oak fermentation (40% of this oak was new). Some of the wine was fermented using the indigenous or wild yeast plus malolactic acid fermentation – my interest was sparked. The wine did not disappoint. Using a large volume glass the aromas were just a big bowl of peaches and cream. The palate was just tremendous with a lovely mouth feel driven with nuts and stone fruit complexity. This wine is without doubt the best chardonnay I have had for a long time. The complexity here means this wine would match well with a lot of foods, so how about a Chinese or Thai banquet. This wine is a cellar door only offering from a grape variety that has such a small amount of vines planted around the world. The only varietal Marsanne I can remember drinking was from Chateau Thabilk. The juice was fermented in old oak barrels and had the lees stirred periodically over 12 months. As for the Chardonnay, there was a wonderful mouthfeel here. Lots of quinces, nuts and nectarines coming together in a long savory finish. If you are looking for a different white wine then this is it! The second making of this wine shows a balance – not the normal balance one talks about, but a balance of sugar. The wine sits between the sweet and dry offerings one normally puts Rose into down from the more sweeter first offering. The result is an infusion of Turkish Delight and strawberries and cream. The comment from the cellar door folks is that the wine does not sell well via direct sales, but when people taste it then it sells quite well. Bring on chilli based Asian foods or a Sunday lunch of cheese and crusty bread. The biggest seller from the Paxton stable is this year a blend of 72% Shiraz and 28% Grenache and I hear it has just won a gold medal at the London International Wine Show. This wine is such a lovely everyday drinking wine that every year I have tasted it, is quite consistent. There is lots of the red fruits from the Grenache and white pepper spiciness that has a finish that has bits of cedar and licorice. You could drink this with just about any food or you could just drink it with friends. The wine is a blend of material from 4 vineyards ie it is the higher quality grapes from the owned vineyards that did not go into the AAA blend. This wine does not disappoint, with a range of red and black fruits and a savory finish of balanced oak tannins, spice and licorice. There is plenty of flavor here so the food match also needs lots of flavor – maybe Mediterranean style Lamb Shanks. This museum release was part of an experiment for screw caps – this release is from the component that was under these screw caps. Ben informs me that the wines under cork were more “developed” than the wines under screw cap when tasted at the same time – so this wine was kept back for later release. The aromas were sweet berries mixed with vanilla, spice and earth. the flavors are a rich full and savory infusion of plums and berries. It maybe boring but I had a marinated steak with a mushroom, onion, tomato and balsamic vinegar sauce tonight and this would go so well with the wine. Another cellar door only wine which is made from different grape varieties depending on vintage and vineyard conditions. For the 2008 vintage the wine was made from 100% chardonnay. The style aim is to have about 70 g/L sugar and about 10% alcohol. The aromas are soft tropical fruits. The flavors are sweet but crisp (indicating good acid levels) of honey dew melons. the finish is not cloying and finishes fresh and clean. As Ben would say – just get them to try it and we normally sell it! How about just drinking this well chilled on a hot summers day (food not required). 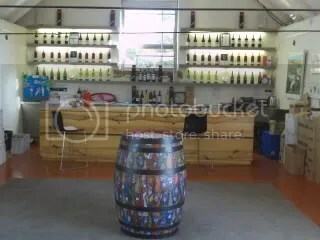 This entry was posted in Mclaren Vale, wine and tagged cellar door, Chardonnay, Grenache, Mclaren Vale, McLaren Vale Wine, Shiraz, wine, wine McLaren Vale. Bookmark the permalink. Thanks for taking the time to visit us at cellar door, share a glass and being what I would call brutally honest (pity you didn’t listen to me say how brilliant all Paxton wines are). The 2010 Pinot Gris is not far away – perhaps we can extract a couple of tenners with this one.